Roundabouts and traffic circles (also known as traffic diverters or rotary traffic islands) are are a type of roadway infrastructure we’re seeing more of in North America. Originated in Europe, these installations work very effectively there. As most people in North America are not familiar with them, and are uncertain how to safely negotiate them, they require additional caution. 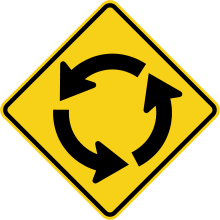 Note that a configuration for a two-lane roadway (one lane of traffic in either direction) is generally called a traffic circle or traffic diverter, while on a four-lane roadway (two lanes of traffic in either direction) it is referred to as a roundabout. In this section, we provide some information on the rules of the road pertaining to roundabouts and similar installations, as well as some tips that are useful to cyclists, motorists and pedestrians encountering them. When approaching a circle, reduce speed and be ready to yield to pedestrians and to other road users. the first road user approaching the circle. If arriving at the circle at the same time as another road user, the road user on the right is to be given right of way (i.e., yield to anyone approaching to your right, arriving at the same time as you). You can prevent confusion in this instance by altering speed (safely) so as to not arrive at the same time as another. If you have right of way, be prepared to stop in case another road user is unaware of, or ignores, the rules. If turning right, signal right on entering, and again in advance of leaving the circle. If going straight, do not signal on approaching the circle, but signal right as you approach your exit. If going left, give a left-turn signal on approaching the circle, then signal right as you approach your exit. Be assertive when approaching a traffic circle, and be ready to take your turn entering it if you have the right of way (see above). Continue pedaling to show intention to proceed. However, be prepared — and don’t hesitate — to stop if a motorist (or another cyclist) is not aware of, or is disregarding, the right of way rule. Cover the brake levers with your fingers to ensure you can react quickly. It is very important to approach the traffic circle in the center of your lane. This is necessary for two reasons: 1) to ensure that you are more visible to other traffic approaching the circle (i.e., not tucked out of sight against the curb) and, 2) to ensure that you do not encourage others to pass you on your left while you are in the circle. Be aware that when you cross a crosswalk at a four-way stop (which are usually marked crosswalks), approaching traffic is required to stop, giving the driver or cyclist a better chance to see you and yield to you. When crossing at a traffic circle/diverter, crossings are generally not marked, traffic is only required to slow down and not stop, and stepping into the roadway puts you in the path of any vehicle in the circle, whether or not they are turning onto the street you are crossing. Crossing any roadway requires caution, but these installations require extra vigilance. — Video and animation showing how to safely negotiate traffic circles. — Detailed information on vehicle, bicycle and pedestrian conflicts in or around roundabouts.